Description: Miltoniopsis is characterized by spreading, white to purple, pansy-like flowers resembling some lower-elevation Miltonia. Flower: Showy blossoms are flat and wide, the broad sepals and petals white or lavender with red or pink markings. The large, spreading lip bears small horns at its base that curl up around the column. Often marked with red or purple radiating lines, the lip exhibits toothed or rib-like projections on its base. The column is short, with a distinct terminal cap. Plant: Tightly clustered pseudobulbs are flattened laterally (imagine a peach pit), each with a single leaf from its tip and additional leaves arising from the base. Leaves are soft and narrow, with papery sheaths retained at the bottom. The inflorescence arises from the pseudobulb base, bearing up to ten flowers. 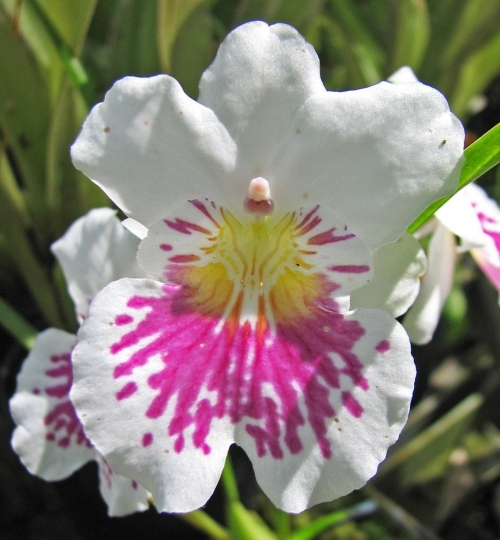 Similar: See Miltonia. Distribution & Diversity: Five species of Miltoniopsis reside epiphytically or terrestrially in the cool highlands of Costa Rica, Panama and the Andes from Venezuela to Peru. Ecology & History: Miltoniopsis roezlii commemorates an infamous orchid collector whose name is synonymous with the overharvest of orchids and wanton destruction of forests. 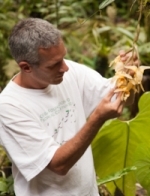 Czechoslovakian Benedict Roezl (1823-1885) spent decades in Central and South America stripping orchids from the wild. He sent as many as one million plants to Europe, boasting of having plundered some eight tons from Venezuela and Panama alone. His collection method was savagely simple: orchid-bearing trees were unceremoniously felled until whole forests had been obliterated. Sea voyage conditions being what they were, few of the delicate plants would survive the journey; it was said that one tree was lost for every “three scraps” of orchid material. During a demonstration in Cuba of a fiber-spinning machine he had invented, the heaving gears seized his arm and destroyed his left hand. He bore a pirate-like hook thereafter, which scattered in terror more than one band of trail robbers seeking to ambush him. He is commemorated today by a Prague statue that hoists an orchid with one hand and clasps a book with the other; evidently the sculptor chose to depict him before the mishap in Havana.